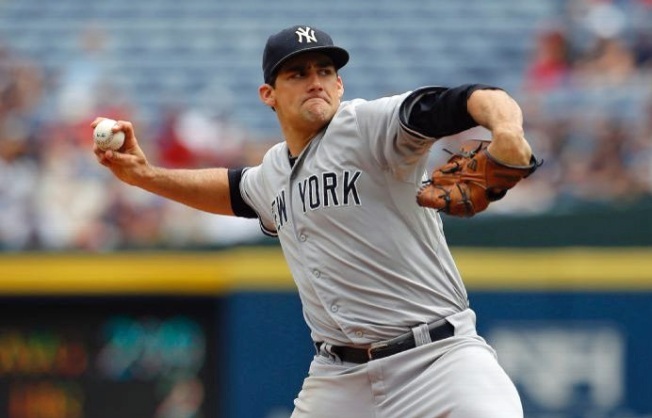 Nathan Eovaldi (14-2) allowed five runs and eight hits in five-plus innings. Jacoby Ellsbury hit a three-run homer, Chase Headley and Stephen Drew each added a two-run shot and the New York Yankees routed the Atlanta Braves 20-6 on Sunday to finish a three-game sweep. All three homers, which helped build an 8-2 lead, came with two outs. Headley and Drew, who had four hits, both drove in four runs. After the Braves cut the lead to 8-5, pinch-hitter Alex Rodriguez drove in two runs with a bases-loaded single in the Yankees' nine-run seventh inning. The U.S. flag at Turner Field flew at half-staff and a moment of silence was observed before the game in memory of Gregory K. Murrey. Murrey, a Braves season-ticket holder, died after falling from the upper deck to the lower-level seats on Saturday night. He was 60. The Braves displayed a photo of Murrey on the video board during the moment of silence.